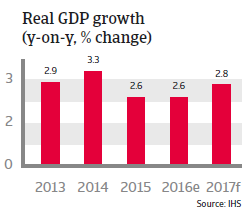 Growing political uncertainty after the president´s impeachment, subdued private consumption, and lower exports to China weigh on economic growth. In December 2016 South Korea´s President Park Geun-hye was impeached by parliament over influence-peddling and dereliction of duty. A constitutional court is now deciding if the impeachment was warranted, leaving open the possibility that Park, who is now on suspension, could keep her office. In the meantime Prime Minister Hwang Kyo-ahn has been acting president. The relation with North Korea remains very sensitive, and has deteriorated since Pyongyang has tested a hydrogen bomb in January 2016. 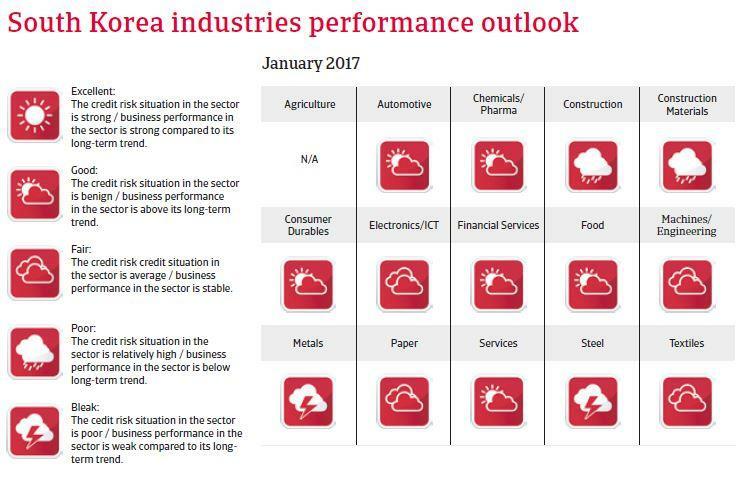 Since 2015, South Korea´s annual economic growth has decreased below 3% due to lower exports (cars, electronic components), which account for about 50% of the country’s GDP. 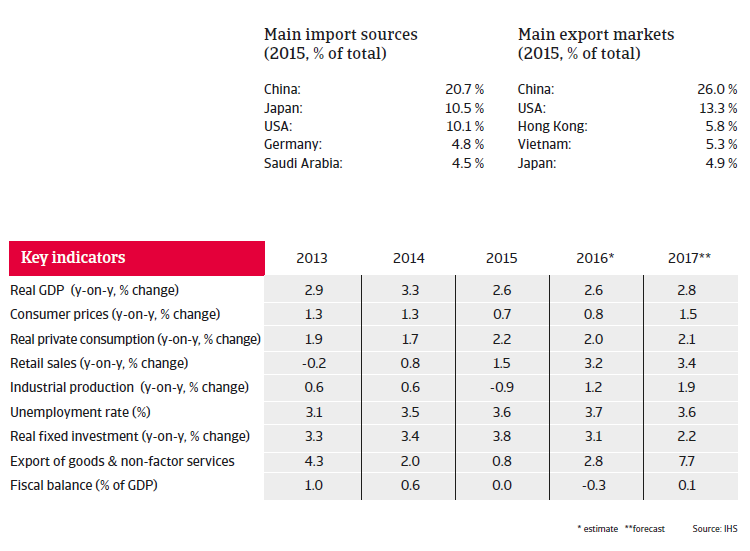 The main reason is lower demand from China (South Korea´s largest trading partner), together with increased international competition from lower income countries. At the same time, private consumption growth remains limited due to debt repayments by households: with debt levels at about 160% of disposable income Korean households are, on average, highly indebted. 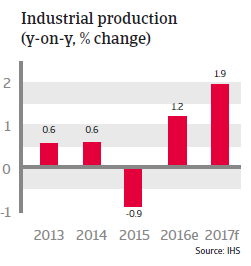 In 2017 business investment is expected to be the main driver of still moderate GDP growth. The low public debt level (37% of GDP in 2016), low external debt (26% of GDP in 2016) and consistent current account surpluses provide the South Korean government with flexibility in times of adverse economic conditions and offer some protection against international investment volatility. A potential risk factor is the high level of private debt, which could turn into a problem if interest rates rise substantially as a consequence of further monetary tightening by the US Federal Reserve in 2017. It seems that South Korea’s current economic model - export driven and dominated by chaebols (the South Korean form of business conglomerate) - is no longer capable of providing sufficient employment and purchasing power growth. More reforms are needed to diversify the economy, away from overly export-oriented towards growth driven by services and domestic consumption. Necessary measures would be an improvement of the business environment through deregulation, increasing labour market flexibility and lowering entry barriers to the still unproductive service sector. However, in the currently more volatile political environment after the impeachment of President Park it seems rather improbable that any major reform bills will be passed in the immediate future.